We briefly touched on the Confidentiality, Integrity and Availability of your company’s data back in August and expanded on the Confidentiality of your data last month. In this post, I’ll focus on the Integrity of your data. 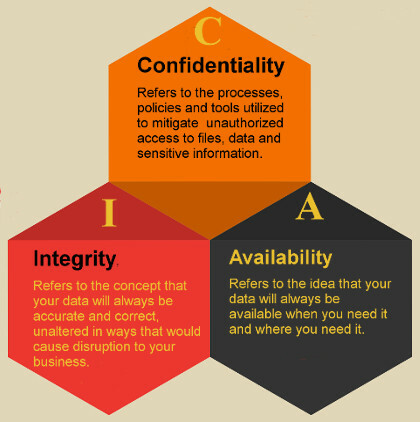 The Integrity of your data refers to the concept that your data will always be accurate and correct, un-altered in ways that would cause disruption to your business. Think about the consequences if the prices in a proposal were accidentally or maliciously altered in a way that wasn’t easily noticed but harmful nonetheless. Imagine the disruption to your business if a large, critical spreadsheet had unintended changes and had to be fixed manually because a recent backup wasn’t in place. What would happen if a hacker accessed your files and maliciously changed facts and figures in documents that you send to clients and vendors or internal documents used to make critical business decisions? Your business could be harmed if accounting or bookkeeping data was incorrectly altered. In short, it should be obvious that if your files are accidentally or maliciously altered, your business will suffer. That’s why it’s so important to ensure that your files and data are always accurate. While there will be some cost attached to preserving the Confidentiality and Integrity of your data, it often will be less than the cost and disruption of data loss or accidental or malicious alterations.